Arlington, VA (January 12, 2016) – Capital Impact Partners today announced that Terry Simonette will retire after nearly three decades of serving as the organization’s president and chief executive officer. Ellis Carr, current chief financial officer, has been named as Mr. Simonette’s replacement beginning in the spring of 2016. “The hardest part about retiring is leaving the mission-driven people who have devoted their lives to social justice. I’ve had the pleasure of working with – and making friends with – so many excellent individuals over the years. This bittersweet moment is made easier, however, knowing I’m leaving the organization in good hands,” continued Mr. Simonette. Terry Simonette has spent his entire career focused on community and economic development to help low- and moderate-income communities have access to the critical services they need to thrive. He joined Capital Impact Partners at its inception in 1984 when it was affiliated with the National Cooperative Bank, and has served as the president and CEO since 1994. “The launch of our new five-year strategy presented the perfect moment for me to retire, and I could not be happier that Ellis has accepted the position. Under his leadership, Capital Impact is poised to create even greater impact for underserved people and communities than ever before,” continued Mr. Simonette. Mr. Carr has nearly 20 years of experience in financial services and mortgage sectors working both domestically and abroad. Before joining Capital Impact in 2012, he spent ten years at Freddie Mac serving in a variety of capacities in investments and capital markets, corporate finance, financial transformation, and the business unit CFO area. Prior to Freddie Mac, he worked domestically and abroad in the fixed income asset management area for Deutsche Bank. Mr. Carr serves on the boards of the NHP Foundation, Martha’s Table and most recently, he was named to the board of directors of the Opportunity Finance Network (OFN), the organization tasked with representing the interests of the Community Development Financial Institution sector. In 2015, he was included in the prestigious Washington Business Journal 40 under 40 list of rising local leaders. Mr. Simonette plans to formally step down from his position in May, 2016. During that time, Mr. Carr will work with board, management team, and staff to gradually assume full leadership responsibilities. A formal process will begin immediately to name a new chief financial officer. 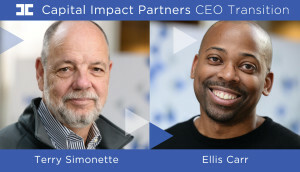 About Capital Impact Partners: Capital Impact Partners transforms underserved communities into strong, vibrant places of opportunity for people at every stage of life. We deliver strategic financing, incubate new social programs, and provide capacity-building to help ensure that low-to-moderate-income individuals have access to quality health care and education, healthy foods, affordable housing, and the ability to age with dignity. A nonprofit community development financial institution, Capital Impact Partners has disbursed more than $2 billion to revitalize communities over the last 30 years. Headquartered in Arlington, Va., Capital Impact Partners operates nationally, with local offices in Detroit, Mich., and Oakland, Calif. Learn more at www.capitalimpact.org.